There is a very good chance that you know someone with heart disease. It is also quite likely that you will personally witness a heart attack in your lifetime. Without Cardio Pulmonary Resuscitation (CPR), a person with a heart attack may have as little as a 1 in 20 chance of survival. If you perform CPR until a properly equipped team from the Fire Department arrives, that person’s chance of survival may increase to as much as 1 in 4. While CPR is only indicated in the most severe type of heart attack, you can clearly see the tremendous payoff in learning this life-saving procedure. Do you know what to do for a heart attack or choking victim? Basic adult and child CPR instructions are available under Pool Safety Tips. The baby and adult CPR instructions contained on this site are only a reference on how to perform CPR. They are not intended to be your only guide. Everybody should be properly trained for CPR by qualified instructors. Cardio Pulmonary Resuscitation is a simple skill that is easily learned in a one session class sponsored by the American Heart Association or the American Red Cross. In CPR, mouth-to-mouth breathing and rhythmic chest compressions are used to supply oxygen to the brain and other vital organs of a person whose heart has stopped pumping. This can buy up to 20 minutes of time until Advanced Life Support measures can be administered by highly skilled paramedics. Worldwide, in thousands of cases every year, CPR from bystanders is credited as making the difference between life and death. The sooner CPR is started, the greater the chances for survival. Unfortunately, many people who have been trained in CPR are reluctant to administer it for fear of doing it wrong. It is important to remember that when indicated: Good CPR is better than bad CPR, but even bad CPR is a million times -better- than no CPR at all! Many people express a concern about the risk of HIV/AIDS and other infectious diseases when performing mouth-to-mouth resuscitation. This is an understandable concern which has to be weighed in each case individually. Most layperson CPR however, is performed on a close friend or loved one. The background health history and risk factors will usually be known to the rescuer. Abolishing myths and minimizing any actual or perceived risks associated with CPR is a core element in most training classes. CPR can not only be used when heart attacks strike, but may save victims of drowning, electrocution, suffocation and drug overdose. CPR not only saves lives, but provides peace of mind during and after an emergency. People often feel helpless when they witness a heart attack, but with CPR training, you will know exactly what to do. Regardless of the outcome, you will know that every possible measure had been taken to assist the person in need. You are likely to find this reassuring during what may be an otherwise difficult time. It’s simple to learn more about American Red Cross CPR and First Aid Training. The cost is minimal, and most training can be completed in a single session! Click here to find your local chapter of the American Red Cross. Click here to go to the American Heart Association web site. 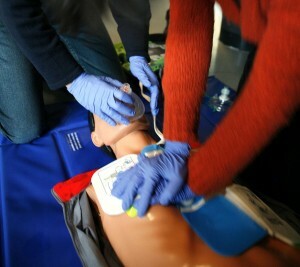 Click here for CPR and other Safety Classes from the ACLS Training Association. ACLS Training Association Web Site.